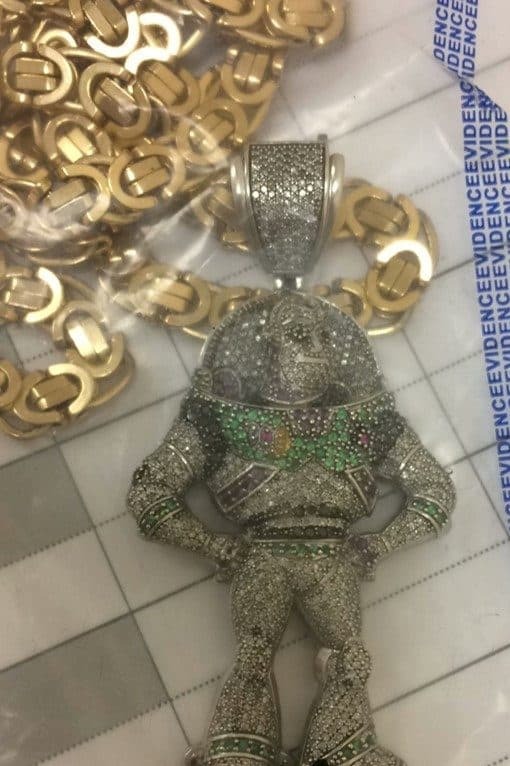 A dealer who ran a nationwide drugs operation was busted with a haul of crack cocaine, cash – and a blinged-out pendant of BUZZ LIGHTYEAR. Perry Allen-Thomas was caught in laying in bed with more than five ounces of drugs around his house during a police raid. The 20-year-old ran the gang using mobile phones – that when searched revealed him preparing the drugs for sale. Drugs seized included 40 grams of heroin, 23 grams of crack cocaine, 96 grams of cannabis and a gram of cocaine. Allen-Thomas, of Wembley Park, north west London, pleaded guilty to possession with intent to supply class A and B drugs on December 21. He also pleaded guilty to possession of criminal property, after cops discovered £3,770 cash, and a Rolex watch worth £7,000. The dealer received three years and four months imprisonment after he was sentenced at Harrow Crown Court. Detective Constable Tom Palmer said: “This man is a gang leader who is intent on supply drugs in London and across the country. A Met Police spokesperson said: “On Saturday, October 27 at around 6am, officers executed a drugs search warrant at the home address of Allen-Thomas. “A search of the address was carried out and a number of items were seized, including four mobile phones, £3,770 cash, a Rolex watch valued at £7,000 and a ‘Buzz Lightyear’ pendant. “A large quantity of drugs were also seized – the street value of the drugs was over £7,000. Inside the address, officers found Allen-Thomas in bed.